Interior designing just got easier with Bruce Furniture and Floor Covering’s complimentary online room planner. 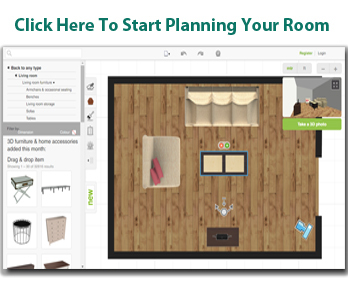 This online interior design and floor planning program is complimentary. No software download is required! Just click on the link and start laying out your room. Use the existing design templates or measure your own room and lay it out to scale. Simply type in your room dimensions, add or remove walls, and start dragging furniture into your room. Also look for a selection of kitchen, gym, home theater, garden, and other house hold items to help your planning. Need additional help? Bruce Furniture offers complimentary in-home design service. Our professional, in-house design team will make sure you don’t make any design mistakes. Whether you’re replacing one piece or re-designing your entire home, Bruce Furniture has design options that are just right for you.